EDITOR’S NOTE 03/21/2013: Please note that this deployment used Version 2.0 of the Rackspace Private Cloud Software. Rackspace is currently on Version 3.0, which installs from packages, rather than an ISO-based installation. Full instructions can be found here: http://www.rackspace.com/knowledge_center/article/installing-rackspace-private-cloud-software. 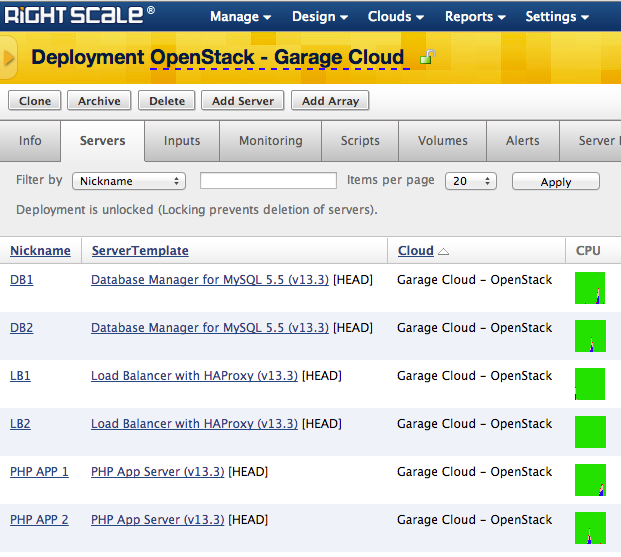 Ever since I built a CloudStack private cloud in my garage, I’ve had the urge to repeat the process with OpenStack. 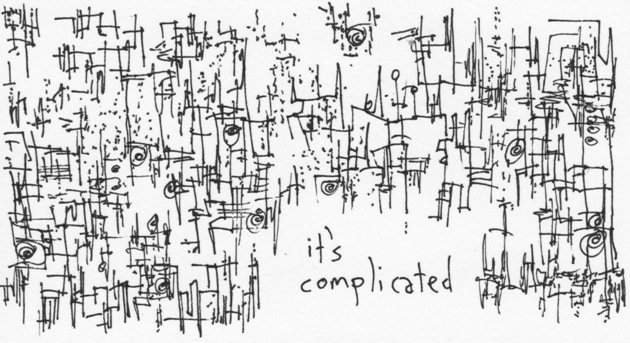 But I have to be honest, I was a tad intimidated by the complexity. There are several services required for OpenStack, including but not limited to Nova, Glance, Keystone, Horizon, and Cinder. All of these would normally have to be fetched from source, then configured to work together. Over time, OS packages have become available that would save me fetching these services from source, but the configuration tasks were still pretty significant. Image used with permission from www.gapingvoidart.com. Just when I thought my own laziness would prevail, I started to look at what Rackspace was offering in its Private Cloud Powered by OpenStack solution. Rackspace has done an admirable job of assembling all the bits necessary to stand up OpenStack and wrapping it up in a nice ISO based installer which they call Alamo. I did all of my experimentation with Alamo v2.0, but as of this writing Alamo v3.0 is available which has broader Host OS support, high availability, and considerably more flexibility. Alamo is more than just a distribution with some pretty packaging though. Rackspace is making use of Chef to perform the configuration of the individual components in an OpenStack implementation. Every new node gets added to Chef and gets assigned a handful of appropriate roles, and the rest is handled for you! The whole process is so simple, I could really summarize the entire experience from downloading the Alamo ISO from Rackspace to a fully functional OpenStack cloud in just two steps. That’s it, after completing those steps, I had a working OpenStack implementation with Cinder. No muss, no fuss, I was suitably impressed. Of course, I wanted to go a little further, so I used the Alamo install ISO and associated Chef roles to stand up another compute node. This too was very straightforward and seemingly effortless. I provided an IP address for my new compute node, and the IP address of the controller node, and it was automatically registered and ready to provision new instances! Oh, and the best part? 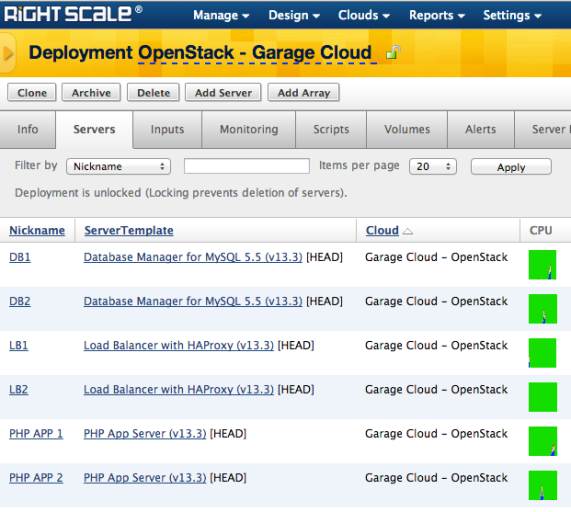 It’s also the reference configuration of OpenStack for integrating with RightScale! Did I mention I was building this whole thing in my garage, using fairly old commodity hardware? Let’s take a step back and talk about that for a moment. First, I am using some fairly modest gear and having individual nodes fill multiple roles. Since I was approaching this from the perspective of getting familiarized with the technology I didn’t have to worry about high performance. My garage cloud infrastructure consisted of three nodes. One dual Xeon quad core box with 8GB memory which acted as the All-in-One node for the controller, compute, and Chef server. A second identical system was dedicated as an additional compute node, and lastly a still older P4 dual processor box was responsible for hosting all of the storage for Cinder. Of course, one of the main requirements for me was the ability to be able to manage my OpenStack powered garage cloud with RightScale. This part was also very straight forward since RightScale and Rackspace have been collaborating from the start on OpenStack support. Registering my newly minted OpenStack cloud was as simple as providing the URL to the keystone API, admin credentials, and a tenant ID. After that, I could see and manage my cloud from the RightScale dashboard. From there, I could easily provision workloads onto my garage cloud using pre-built solutions from the RightScale MultiCloud Marketplace, like the 3-Tier PHP app pictured below. If you’re like me, having the Rackspace Alamo distribution makes approaching an OpenStack private cloud PoC much less intimidating. If I can do it in my garage, it should be a breeze for an enterprise to get up and running quickly. 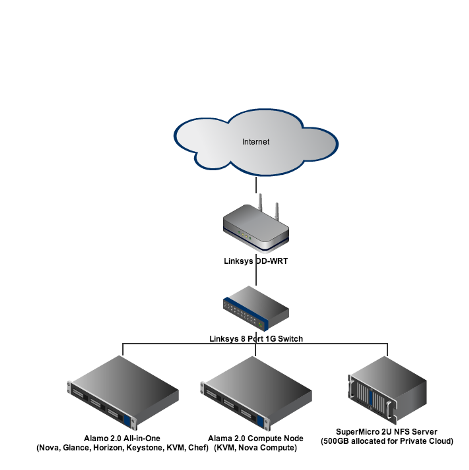 So why not download Alamo v3.0 and put it on some lab hardware? In no time you’ll be able to show your teammates and management the benefits of dynamic provisioning and configuration. Add RightScale to the mix (take it for a 60 day free test drive here) to jumpstart the use of your new cloud with pre-built application environments. You can also give team members an easy interface for doing self service provisioning on your cloud. Then when the demand exceeds the capacity of your PoC, you can work with Rackspace directly to setup a production environment in your own datacenter, or one of the Rackspace collocation facilities. So i wanted to try the ‘alamo iso’ myself, i cant’t find it any where. When pressing download on the private rackspace cloud page i can ‘download’ three scripts … nobody speaks about an ‘all in one’ iso ? So trying to learn the first thing about this- what is the advantage of a private cloud? Seems from the diagram you have basically set up a server share accessible by users through the internet. What’s new about that? What about this makes it a “private cloud”? Should I state the obvious since nobody else has? 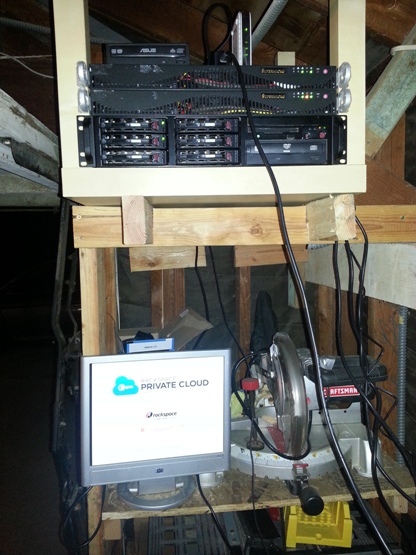 You have servers, switches and routers sitting in moisture, heat, pest and vermin (insect) space. It is located in a wooden shelf rack above your miter saw,,in an unheated/uncooled garage. Why would you do that? Has anybody every told you that climate, dust and temp are killers for hardware? No? Well they are. I know you are proud of your configuration skills, for a system that is going to go belly up on you with no notice. You don’t need a server room, but it does need to come out of the garage, next to the shovel and rake. I think this is a forest for the trees thing. Q1) May i clarify do you mean with the downloaded Alamo ISO from Rackspace to a fully functional OpenStack cloud in just two steps where step 1 is installation while step 2 is some configuration of the storage … then already have a simple OpenStack workflow to provision VM ? ?